BMW's first plug-in hybrid vehicle will focus not just in saving the earth, but also on satisfying its driver's need for speed. 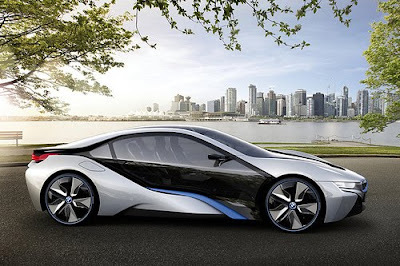 Like the Chevrolet Volt, the BMW i8 concept combines a traditional gasoline engine with an electric drivetrain. 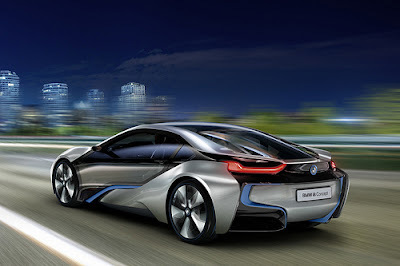 According to BMW, the i8 can be as fuel-efficient as the best hybrid cars, while still delivering sports car-like performance. An electric motor drives the front wheels, while a traditional gasoline engine drives the rears. 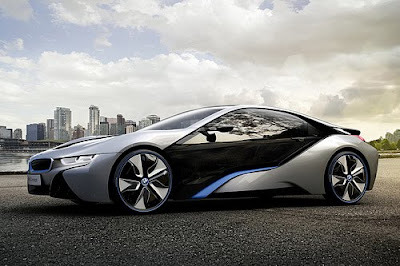 The i8 can thus act as a front-, rear-, or all-wheel-drive car depending on which power sources are running. An "energy tunnel" containing the battery and drivetrain electronics runs down the middle of the vehicle, connecting the two axles. The electric motor and engine peak at a combined 349 hp and 406 lb-ft of torque. That means the 0-to-62-mph sprint requires just 4.6 seconds. Top speed is electronically restricted to 155 mph. BMW says overall economy in European testing will be 2.7 liters per 100 kilometers, or 87 mpg. In real-world driving, the company expects the i8 to return mileage of 33 to 47 mpg. As gloating company executives note, no other production car can return the same combination of performance and economy. The front-mounted electric motor is the same unit used in the i3 electric-car concept, but it is slightly modified to offer 128 hp and 184 lb-ft of torque. Because the i8 also has a gasoline engine, the electric motor's battery pack is significantly smaller than that in the i3. The i8 has an all-electric driving range of about 20 miles and can be fully charged in just under two hours. The electric motor can also recharge the battery, acting as a "through the road" hybrid system that can bolster the engine's output. At the rear axle, a turbocharged 1.5-liter three-cylinder engine produces 220 hp and 221 lb-ft of torque. BMW would only tell us that the engine is mated to an "automatic" transmission with "enough" speeds. It may be a traditional automatic or perhaps a dual-clutch unit. 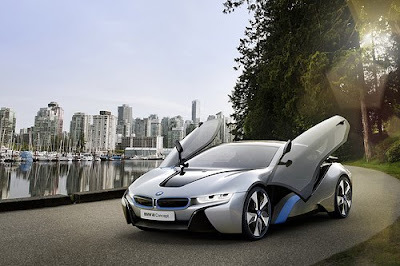 However, BMW doesn't think the transmission in the i8 is very important to discuss as the electric motor provides plenty of torque regardless of the gasoline engine's operating speed or gear. i8 Concept. 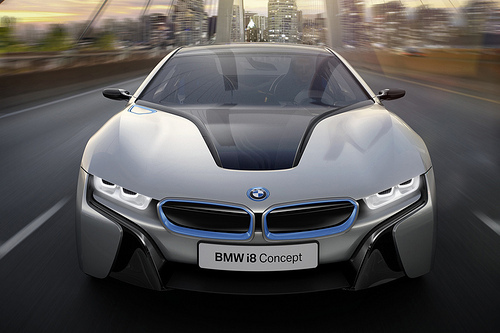 The electric motor in the i8 Concept has been adopted from the BMW i3 Concept and modified for use in the i8 Concept’s plug-in hybrid power train—i.e., for operation with a smaller battery pack and in conjunction with an internal combustion engine. It drives the front axle, while a 164 kW/220 hp turbocharged three-cylinder gasoline engine developing up to 300 N·m (221 lb-ft) of torque drives the rear axle. Together, the two drive units take the vehicle to a governed top speed of 250 km/h (155 mph). 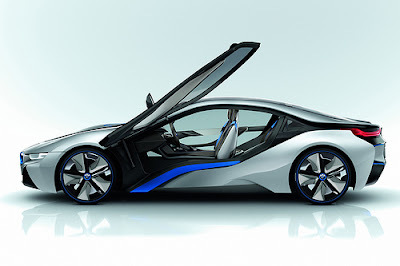 Like the electric motor, the 1.5-liter three-cylinder gasoline engine was developed entirely in-house by the BMW Group. A high-voltage generator attached to the internal combustion engine can generate power for recharging the batteries. This option is only used to increase the range of the vehicle while out on the road, and is not intended as a substitute for stationary recharging at an electric power socket. 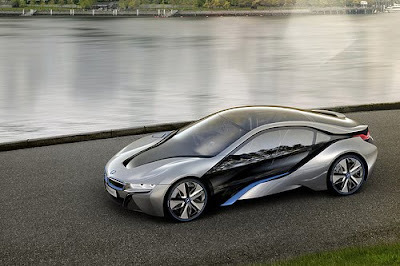 Locating the electric motor at the front axle of the BMW i8 Concept optimizes braking energy recuperation, since the front axle is where greater braking forces are developed due to the dynamic wheel load shift when decelerating. Whenever there is a chance to recuperate braking energy, intelligent driving dynamics systems make the most of it, taking into account traction conditions and driving situation, without compromising stability and dynamics, BMW says. This allows very high levels of braking energy recuperation even in the wet or in snow. Depending on requirements, braking is initially provided by the recuperation function and only when more powerful braking is required is the conventional brake system engaged.